Some people truly believe that director James Cameron keeps pushing back the release dates on his four upcoming Avatar sequels, hoping the world implodes before he actually has to make them. Perhaps that is the case, as Avatar 2 has once again been delayed, with the other three subsequent sequels also getting new release dates. We were originally supposed to see a new Avatar movie in 2013. That won't happen until 2020. James Cameron and his crew gathered to announced the new release dates on Facebook. Last we heard, Avatar 2 was keeping its 2018 release date, with Fox promising that wouldn't change. Unfortunately, they were unable to keep that promise. As Avatar 2 will now hit theaters on December 18, 2020. And it will immediately be followed a year later by Avatar 3, which now arrives on December 17, 2021. There will be a break before the final two movies, with Avatar 4 premiering three years later on December 20, 2024. The wait won't be as long for the final installment Avatar 5, which hits one year later on December 19, 2025. Says James Cameron, who offers no real reason for the delay. "Great to be working with the best team in the business! 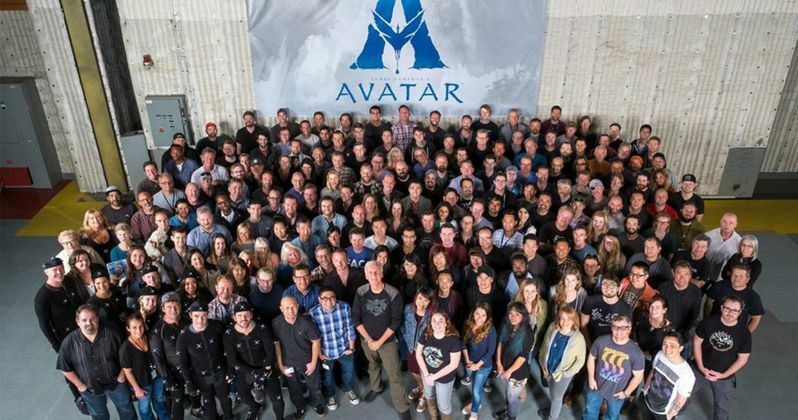 Avatar takes flight as we begin concurrent production on four sequels. The journey continues December 18, 2020, December 17, 2021, December 20, 2024 and December 19, 2025!" The Avatar movies are being shot simultaneously, with a proposed production start date set for this summer. Avatar 2 will be going up against Sony Pictures' animated movie Vivo, from creator Lin-Manuel Miranda. As for the other three sequels, they have those weekends all to themselves at the moment. But we're sure that will change in the next couple of years. Especially since Disney and LucasFilm have become attached to their Star Wars December release slot. Last year while attending CinemaCon, James Cameron announced the 5th Avatar movie while swearing up and down that Avatar 2 would be in theaters by December 2018. At the time, he claimed that his story had expanded. The original Avatar is still the all-time box office champion having pulled in $2.8 billion. James Cameron initially set out to make two sequels for a proper trilogy, the first movie of which was supposed to have been in theaters nearly five years ago. But he had way too much material, and the story just kept expanding. Speaking at last year's CinemaCon, Cameron said this to theater owners and distributors. "We have decided to embark on a truly massive cinematic project, making four epic films, each of which stands alone but together forms a complete saga. Trust me, these are films that were designed to be seen in theaters and on the big screen first." Jon Landau joins James Cameron in producing these movies for Lightstorm. Zoe Saldana, Sam Worthington, Sigourney Weaver, and Stephen Lang will all return to reprise their roles in some capacity, though it hasn't been revealed if all four actors will appear in all four sequels. The scripts have been written by Cameron alonsgide Josh Friedman, Rick Jaffa & Amanda Silver, and Shane Salerno. Cameron said this last month about a possible delay. "What people have to understand is that this is a cadence of releases. So, we're not making 'Avatar 2,' we're making 'Avatar 2,' '3,' '4,' and '5.' It's an epic undertaking. It's not unlike building the Three Gorges dam. So I know where I'm going to be for the next eight years of my life," he added. It's not an unreasonable time frame if you think about it. It took us four-and-a-half years to make one movie and now we're making four. We're full tilt boogie right now. This is my day job and pretty soon we'll be 24/7. We're pretty well designed on all our creatures and sets. It's pretty exciting stuff. I wish I could share with the world. But we have to preserve a certain amount of showmanship and we're going to draw that curtain when the time is right." Its unclear at this time if the United States will still be around in 2025, or if movie theaters will still exist. It's very possible that the human populace will never get to see the first Avatar sequel let alone all four of them. While we ponder that thought, take a look at the production photo James Cameron shared with the world before crawling back into his hole to 'make' these movies.